Our latest segment of our “Meet the VMAC Team” blog series features Pam Henselin. 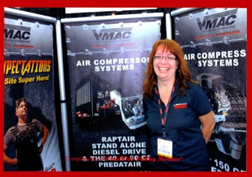 Pam is an Inside Sales Rep with over 10 years’ experience at VMAC. 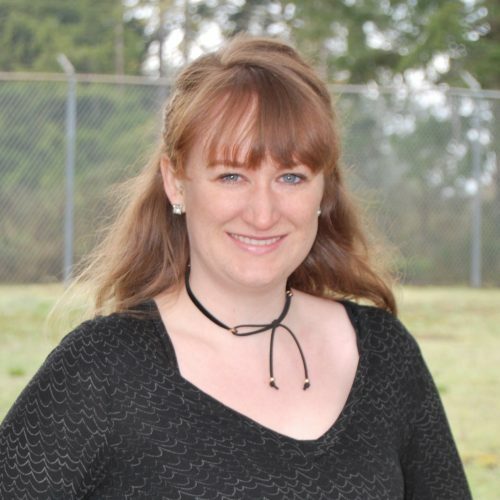 During her tenure, Pam has dabbled in a variety of roles at VMAC, including Marketing, Production, and Reception. Pam took a few minutes out of her busy day to answer some questions about her experience at VMAC and share some personal details as well. WHAT DOES AN INSIDE SALES REP AT VMAC DO? Our day-to-day varies, but we basically work to ensure our customers’ needs are well looked after. We answer phones, find parts and accessories, suggest and recommend solutions for air compressors and multi-power needs, quote systems, enter orders, and help our dealers with customer requests. We provide exemplary customer service and we want customers to know that they are in good hands, that they can count on us and trust us. Helping customers find parts for their older systems is always an interesting challenge. It’s important to help source the part as quickly as possible to help them get their systems back up and running so they can continue on with their work. I also enjoy learning about our customers, the type of the work they do, and what they like to do on their off time. It’s nice to have the opportunity to connect with our customers and dealers. Tradeshows are also great because I have the chance to meet the people who I’ve been talking on the phone to for years! There’s humour every day at VMAC, that’s what makes my job so enjoyable. I particularly enjoy the wrong numbers that we get from time to time. A retirement fund is one digit off from our number, so we get people calling to ask about their retirement fund. I just transfer the calls to the right number for them! We are also one number away from an alarm company and we handle these calls in the same fashion. WHY DID YOU CHOOSE TO WORK AT VMAC? I worked for a vendor to VMAC prior to joining the team. I always felt it was a warm and welcoming company to walk into and work with. I left VMAC for a brief few months in 2009 to try my hand at a different line of work, but I missed the people (both coworkers and customers), so when the opportunity to come back presented itself, I slid back into my old chair at my desk and picked up right where I left off! WHAT DO YOU LIKE TO DO ON YOUR OFF-TIME? Now that our kids have moved out (Alex, 29, Stephen & Scott, 25, yes, twins! ), we’ve downsized, and I love to hang out at our half acre property in Cedar, just outside of Nanaimo. During the fall and winter we have weekly weekend bonfires with our grown-up kids, neighbours and our 17 month old grand-neighbour baby. During the summer months we love to camp around our beautiful island. We are heading out at the start of August for a 10-night trip. My husband and I also play on a local mixed slow pitch ball time with our kids. I enjoy riding on my husband’s Harley, and gatherings with friends and family. My husband and I like to build outdoor furniture out of pallets and old truck tailgates for our friends and family. Thank you, Pinterest for the inspiration! WHAT’S YOUR FAVOURITE THING ABOUT LIVING IN NANAIMO? I enjoy the slower paced lifestyle on the island. We moved here from Toronto, Ontario about 22 years ago, and at the time I was a bit culture shocked at only having one highway on the island, but now the shock goes the other way when we go to the mainland or back home to visit! Nanaimo was a fantastic place to raise our kids—we spent a lot of time camping on the west side of the island right on the beach. I’m looking forward to continuing to exceed our customers’ expectations. We’ve grown a lot at VMAC and we have a very strong team, ready to knock your socks off! To learn more about VMAC’s sales team, including our Sales Manager, Jim Raymond, National Sales Reps, and the Inside Sales Team, visit our Find a VMAC Sales Rep page.